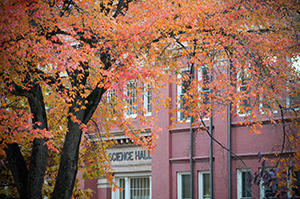 Old Science Hall was originally constructed in 1906 and was previously known as Science Hall prior to the construction of Hartline Science Center. It currently houses the art studio, photo studio, and printmaking studio in addition to faculty offices and classrooms. The building is also the only academic building that is remote from the academic core that surrounds the Academic Quadrangle.